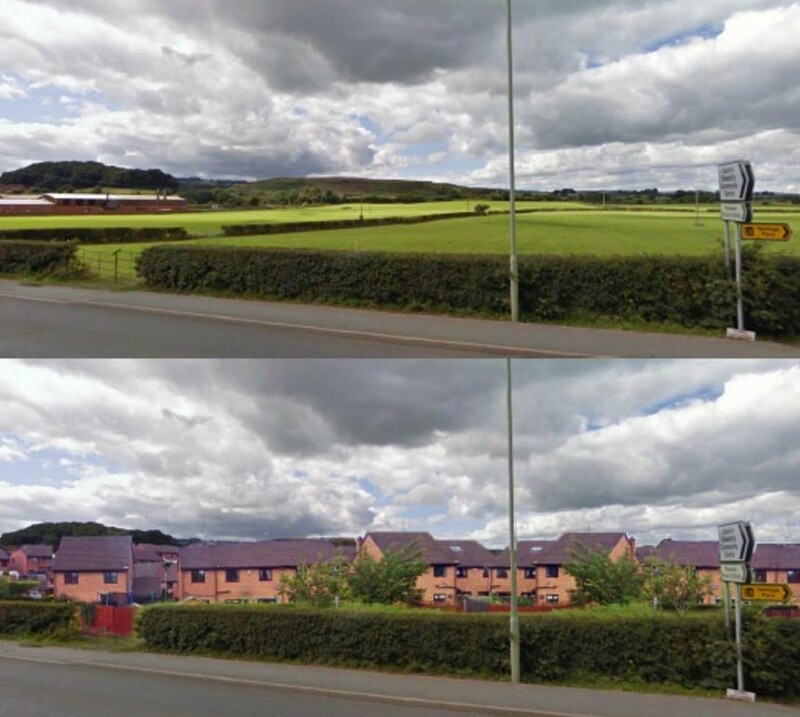 Shropshire Council is on notice that it will be taken to Judicial Review if today’s [17 December 2015] meeting of the full Council votes through the controversial OSWOO4 development site which would see up to 117 houses built on the slopes of the nationally important Old Oswestry Hillfort. The site is listed in the council’s SAMDev strategic plan which identifies sites which have the potential to be developed within Shropshire and the move to test the legality of the inclusion of OSW004 in the SAMDev plan was signalled in a statement to the media by the Hands Off Old Oswestry Hillfort [HOOOH] campaign earlier this week. It also emerged late Wednesday [16 December 2015] that HOOOH’s lawyers had written to the Council to warn it that proceedings to seek a Judicial Review were likely. This significant development in the ongoing controversy over development at Old Oswestry comes as the Conservative controlled council is still reeling from the sudden resignation of Council Leader and property developer Keith Barrow, over allegations of an undeclared conflict of interest relating to the involvement of the accountancy firm D.R.E & Co with a council owned company of which Mr Barrow was chair. The campaign group also announced it is launching a crowd funding effort to pay for the legal proceedings. A full Judicial Review can cost upwards of twenty thousand pounds. However, the campaigners appear confident that there is an increasing quantity of evidence which would make the risking of such a large amount of money viable as well as necessary. As just one example of the issues which a Judicial Review would have to explore, English Heritage [now Historic England] is accused of failing to ensure conservation legislation and planning guidance were properly applied by the council planners. Instead it is alleged the organisation chose to roll over and collaborate with the council and the would be developer, farmers G F Kempster and Sons. It has also been suggested by HOOOH that Historic England’s apparent acquiescence was an attempt to buy permission to excavate the site of an extensive and well preserved World War One training trench system also present on the site. The World War One training trenches became a focus of the campaign partly because among the thousands of soldiers who trained on the slopes of the hillfort was the internationally famous war poet Wilfred Owen who was born at nearby Plas Wilmot in 1893. Plas Wilmot has itself been the subject of yet another controversial planning decision by Shropshire Council, which permitted the building of seven houses in the former orchard, paddock and vegetable garden of the house. However, back at Old Oswestry, the request from English Heritage to the landowner to permit the excavation of the training trenches at Old Oswestry, which would coincide with the centenary of the Battle of the Somme in 2016, seems to have become deliberately weaponised by the would be developer’s representatives in the ongoing planning row. This kind of less than subtle hard ball is of course perfectly legal as part of the negotiations which surround planning applications. It is up to the other parties in the negotiations to respond in an appropriate way. Given that it might be thought the principled response for a body with a remit to protect the past and defend the public interest to make to such high pressure tactics might be to tell J10 Planning that such a linkage was not acceptable and they should seek out a place to multiply themselves. Indeed, some of the early correspondence relating to the J10 proposals was robust, suggesting that the consultants and their client had not “fully taken on board the significance” of the hillfort and its setting and had also provided “a one sided analysis” of the benefits of the proposed development. However, HOOOH counter this by stating that the view is important because it actually faces the tribal center of the Wrekin and of course the view across green fields towards the mass of the hillfort from the town would be obstructed by up to 117 houses. It is an irony of the Old Oswestry battle that, while English Heritage/Historic England seems content for now to see the edge of Oswestry encroach still further on the greenfield setting of the site, the aerial photograph of the hillfort carried on the English Heritage interpretation board at the site is carefully cropped to show Old Oswestry in apparently pristine rural isolation. In fact the built up edge of Oswestry already approaches to within a few hundred meters of the hillfort’s southern ramparts demonstrating beyond doubt that the setting of the hillfort is already extremely fragile and sensitive. In November a spokesperson for Historic England publicly nuanced the organisation’s position telling thePipeLine that the organisation still had reservations about the development plan, leaving open the possibility that Historic England might oppose the development at a later date. Unfortunately, that caveat came too late for the planning inspector, Claire Sherratt who, to the dismay of HOOOH and other opponents of the scheme which also include the Council for British Archaeology and the Campaign to Protect Rural England, justified the inclusion of OSW004 in the Shropshire development plan partly on the grounds that Historic England did not oppose it. A factor which she confirmed she granted “considerable weight”. Oh well, if the development were to go ahead the developer might even pay for some new interpretation boards as a big “Thank you” to English Heritage/Historic England for facilitating their profitable development; sorry; might even pay for some new interpretation boards as a piece of constructive community engagement. They would just have to re-crop the air photo slightly tighter to remove over one hundred houses. Of course, before that becomes necessary the case might well be headed for Judicial Review and it remains to be seen which side of the argument the new look English Heritage will take as custodian of the site? Cynics will expect some kind of fudge. After all, English Heritage, which now manages the national portfolio of historic sites including Old Oswestry, was only recently split from the statutory advisor Historic England and thus was party to the permissive policy for OSW004. While of course English Heritage is also still dependent on the decidedly pro house building Cameron Government for much of its funding as it transitions to life as an independent charity. However, if the senior management of the charity decides to put down a marker as to its future role as the potential protector as well as the manager of the national portfolio of historic sites. A stance English Heritage members might support. The Judicial Review could easily end up with the astonishing spectacle of English Heritage on one side and Historic England on the other facing off over competing visions of what represents the best practice for the future conservation of the site in the most pointlessly fratricidal battle since Tweedledum confronted Tweedledee over that broken rattle. Historic England and Shropshire Council say build houses on the slopes. HOOOH and a who’s who of British Archaeology say don’t build houses. Of course, stepping back from the immediate local arguments there are three great overriding facts in the whole Old Oswestry controversy. First that this is a fight that the wider heritage community must engage with or lose all credibility as a serious conservation movement. The involvement of so many leading academics and organisations in the increasingly effective HOOOH campaign is testament that the sector recognises this. Equally this is also a fight which the heritage community cannot afford to lose because it will redefine what level of development is and is not acceptable under the National Planning Policy Framework within the settings of our most important and sensitive heritage sites. The final and perhaps greatest fact is that whatever happens in Shrewsbury this Thursday and perhaps afterwards in the Courts, any fight over Old Oswestry and SAMDev site OSW004 is merely the under card for the main bout which will take place over the proposed Short Tunnel at the UNESCO World Heritage Site of Stonehenge.